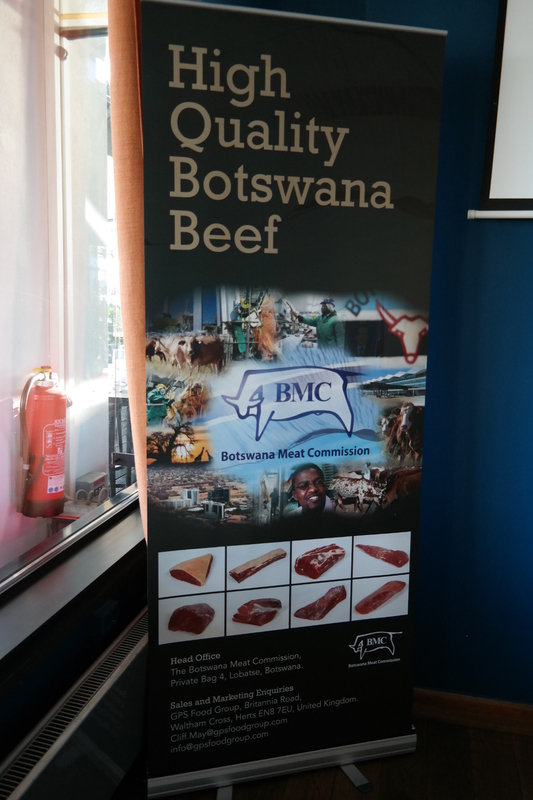 On Thursday 15th September 2016, the Embassy, the Botswana Honorary Consul in Hamburg, Botswana Meat Commission (BMC) and Global Protein Solution (GPS), marketers of Botswana beef on behalf of the BMC based in London hosted a promotional Botswana beef tasting function in Hamburg, the 3rd largest port city in Europe. The function was attended by selected restaurateurs. In her welcome remarks the Charge d’ Affaires a.i. at the Embassy of the Republic of Botswana in the Federal Republic of Germany stated that the event presented the Embassy with an opportunity to promote a product that has been part of Botswana and historically played a significant contribution to Botswana’s economy in the last 50 years. She also acknowledged with appreciation that while there is recognition amongst some in the German Society for Botswana’s well established traditions of good governance, democracy, respect for human rights, Botswana’s rich wildlife reserves and diamonds, very little is known about Botswana beef in Germany especially in relation to other beef producing countries. In this regard, the Embassy and GPS Food Group recognised the need for intensive marketing in creating awareness about Botswana and what it stands to offer. Guests at the event were treated to a variety of dishes with beef tartar using the Botswana beef as well as fillet of rib-eye steak as the main dish. The GPS Food Group’s presentation was focusing on fundamental elements of interests of the target market and the importance of the European Markets for Botswana beef highlighting common principles important to the European market. These include that Botswana cattle are raised on the veld, maintenance of high hygienic standards at Abattoirs which contribute to a long shelf of 6 months for chilled beef, while other countries have less than six months and accreditation of the Botswana abattoir facilities in compliance with European Union (EU) standards.